A dramatic tale of revenge sees Nariko, a fiery red-haired heroine embark on a quest for vengeance against an invading King and his army. The story builds around the ancient Heavenly Sword which once belonged to a powerful deity. It can never be wielded by a mortal without it draining their life-force, killing them within hours. When the invading King (played by Andy Serkis) destroys the warrior clan that guards the Heavenly Sword, the clan leader's daughter, Nariko, takes up the sword in a desperate fight for survival. Nariko must now pay the ultimate price as she embarks on one last mission of vengeance against the King and his army before her life is finally drawn to a close... 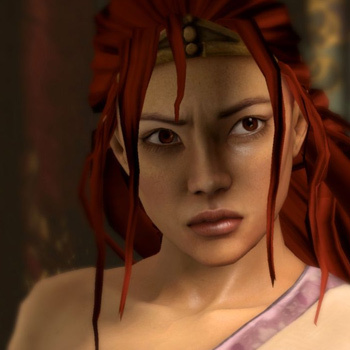 The Heavenly Sword itself can Transform into Three Distinct Stances – Players can switch between on the fly allowing players to create their own fighting styles. The Combat Engine can Scale Up – From sophisticated one-on-one encounters to one-on-many, where enemies employ intelligent squad-based dynamics, right up to combat against battalions pushing real-time gameplay and AI to unprecedented new levels. Physics-based Combat – Players can sweep debris against opponents, kick tables to halt an oncoming surge of fighters, smash the enemy into the scenery or throw bodies into other enemies using aftertouch controls.